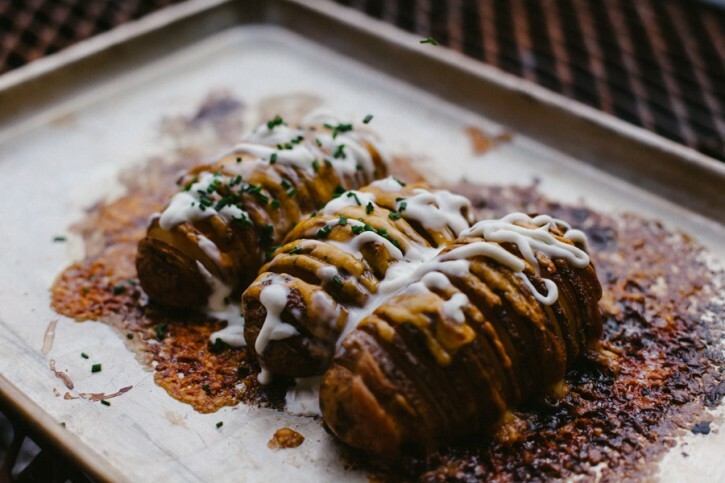 These Hasselback potatoes have been pretty popular across food blogs for some time now. We couldn’t resist the opportunity to cook them on the grill and add a couple of our own personal touches in the process. 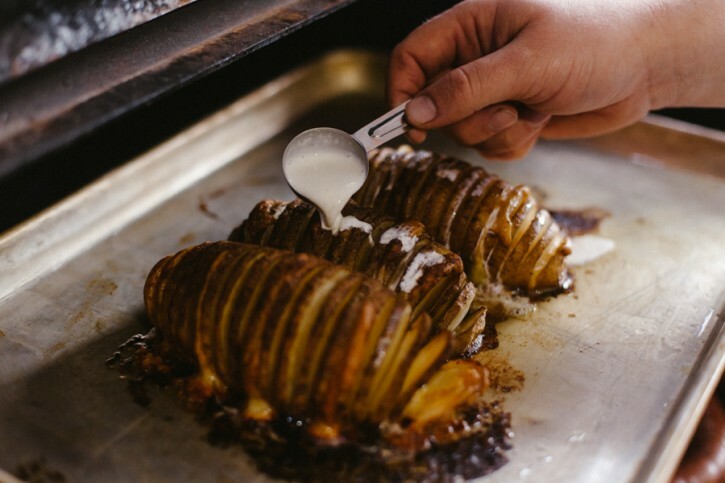 If you’re new to the idea, the Hasselback potato is a potato that has been cut into vertical slices, though not all the way through so that the potato holds together while it bakes. We’re adding two different cheeses, butter, cream and more for that scalloped potato flavor that we all love! 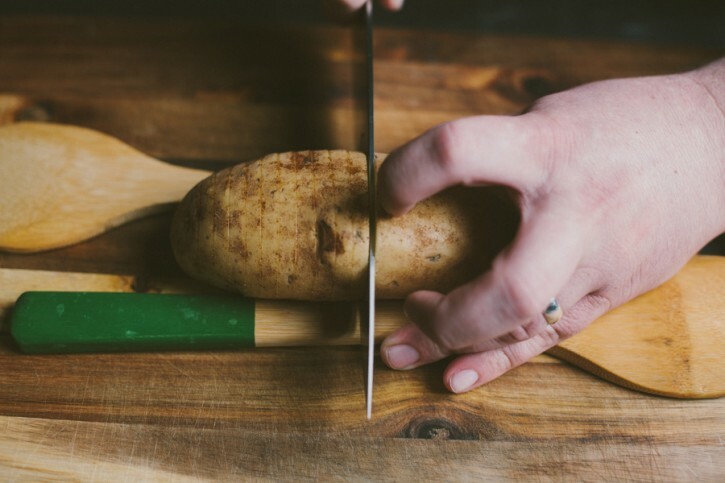 Placing a wooden spoon on either side of the potato stops the knife from slicing all the way through the potato. 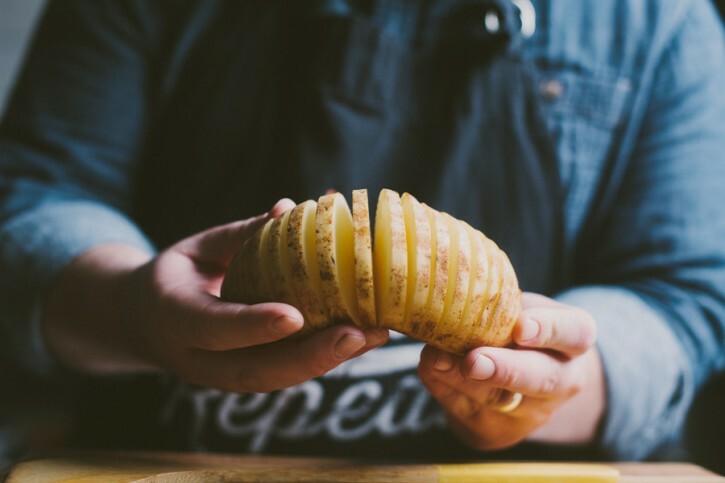 This allows the potato to hold together while cooking, and leaves more surface area exposed for additional texture and the opportunity to season more of the potato. 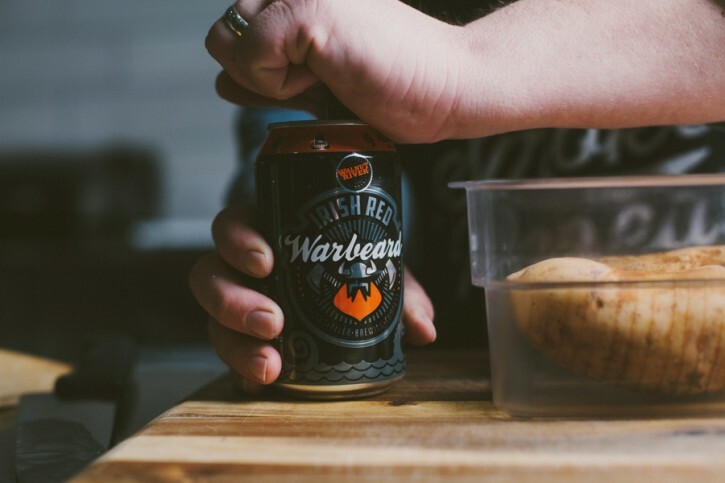 Just for fun, let’s soak our potatoes in beer. Because, why not? By the way, we’re pretty excited about Walnut River Brewing Company canning a couple of their killer beers, and making them available for us to take home anytime! We’re using their Warbeard Irish Red. 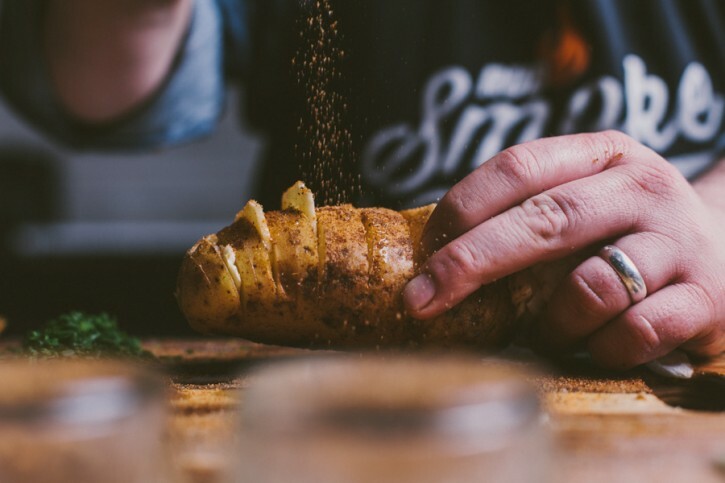 Jack Stack Barbecue French Fry Seasoning is the perfect rub for the job. It does well on vegetables and meat, as well, but it was made for the potato. A little cream and cheddar added to finish the cook. 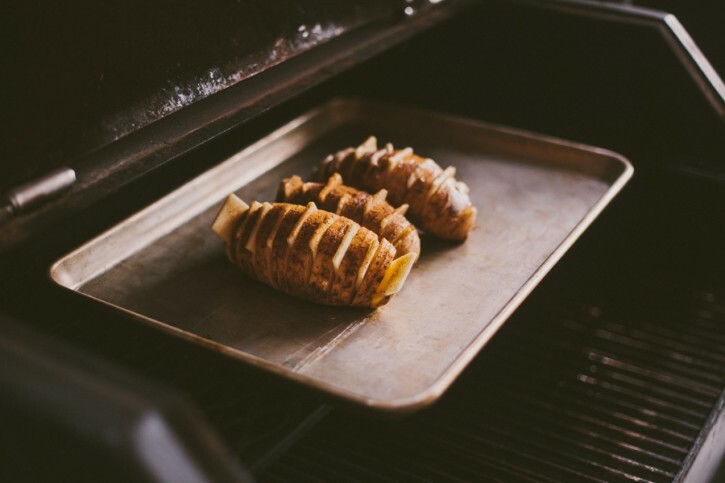 Preheat your Yoder Smokers YS640 to 400ºF, set up for indirect grilling. Place a potato on your work surface. Place wooden spoons on either side of the potato. Slice straight down from the top until you hit the spoons (so you don’t cut all the way through). Continue making these cuts every 1/4” down the entire potato. Repeat with the remaining potatoes. Place the potatoes, cut side down, in a shallow container. 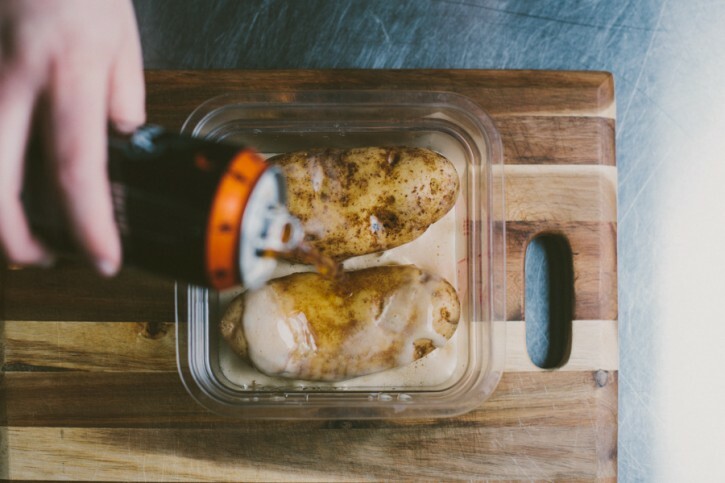 Pour the beer over the potatoes and soak for 30-60 minutes. Remove from beer. Insert a thin pat of butter in one of the first cuts. Skip a cut then insert a slice of asiago cheese. Continue alternating until you reach the other end. Repeat this with the remaining potatoes. Drizzle a small amount (about one tablespoon) of olive oil over the top of each potato. Season the potatoes liberally with Jack Stack French Fry Seasoning. Place the potatoes on a sheet pan. Place them on the second shelf of the cooker. 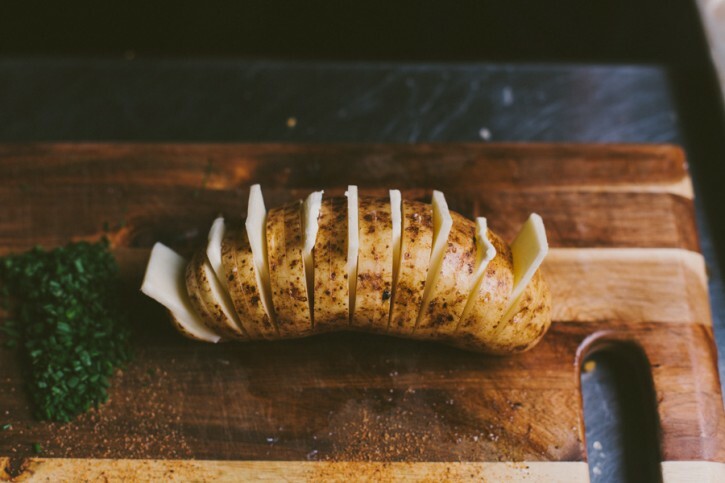 Bake the potatoes until they are tender all the way through, about 60-75 minutes. Then, drizzle the top of each potato with one tablespoon of heavy cream. 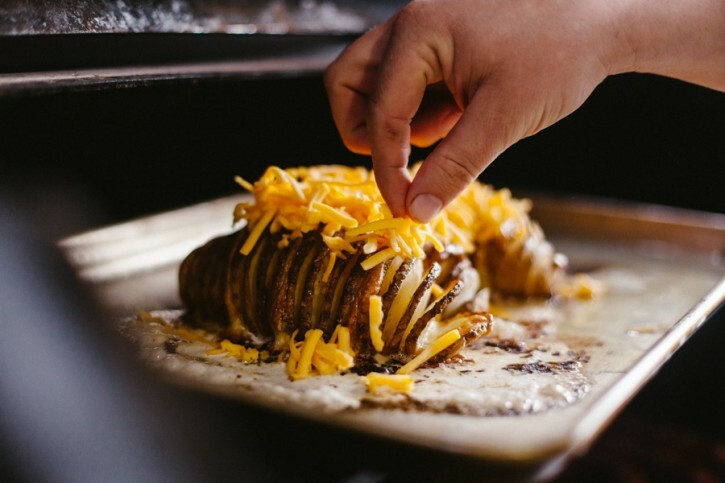 Top the potatoes with the grated cheddar cheese. Bake an additional 15 minutes. Remove and serve topped with creme fraiche and fresh chives.